Okay, it's true that I'll be doing the multilingual daily newsletter (Yiddish, English, maybe some Russian, Spanish—in whatever languages events happen) and other computer-related stuff there, but there is also going to be some hot Yiddish culture, starting with klezmer. The brochure for the 13th edition of KlezKanada's Summer Institute is now available! Download it in PDF form from our website. Also available is the Workshop Choice Sheet. Print it, fill it out and send it in! 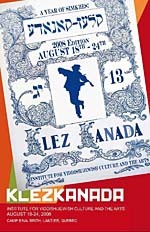 Download the 2008 registration form/a> and send it in today to reserve your place at KlezKanada!! Our new website is almost finished and should be online very soon! There, amongst bright colours, you will find full faculty bios, a year-round calendar of events, program highlights, pictures, videos and more!! Can't wait until August?? Recapture some amazing moments from last year's concerts on KlezKanada's YouTube Channel.